His real name is Andy Hernandez but he names himself after the coati, sometimes called coatimundi, a mammal of the raccoon family, the various species of which dwell in South and Central America. His instruments are vibes and marimba, and with Kid Creole, he played in Dr. Buzzard’s Original Savannah Band before becoming a primary conspirator behind Kid Creole and the Coconuts. His publishing company is Cri Cri Music, and I wonder if it is named after the great Mexican children’s musician, Cri Cri. The shrill female chorus sings his thoughts: “Me no Popeye, you no Olive Oyl.” No love lost here. Unlike the words of Twilight 22 or Grandmaster Melle Mel, there is no social critique in this song. It is just wacky party music. And also unlike those urban rappers the music is not driven by techno beats, mixing, breakbeating, and scratching. This is warped Ricky Ricardo madcap rumba Latin jive with a heavy dollop of rap on top. Andy Hernandez, “Me No Pop I,” Cri Cri Music (BMI) (1980). 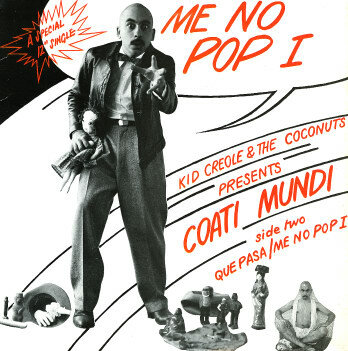 From Coati Mundi, Kid Creole & The Coconuts Present Coatimundi (12-inch single), Antilles Records, AN 807 (1980). Album Design – Not credited.